"Authorities were called to Tiger Woods' 2.4 million dollar home..."
"Tiger Woods pulled out of the driveway of his 2.4 million dollar home..."
I can't tell you how many times I've heard his home price quoted in the news reports. I guess they're thinking that's pricey, but I look at the mansion, and I think, "That's it?!?" That might seem like a crazy reaction to someone in a more isolated area, but I'm telling you, I can't find a decent 3 bedroom in Stamford for under 550,000, so a mansion at 5 times the price, on a lake in Florida, seems like a REALLY GOOD DEAL. Is he in a really crappy part of Florida or something? Also, is anyone else surprised the 911 caller didn't scream at some point, "Oh my god, it's Tiger Woods!" I'm impressed by that person's discretion. I tell ya, it's a weird story overall. I don't really buy his wife smashing out the back window of the Escalade to save him, because I don't even think the side of the car was blocked by the tree. Why would she haul him ALL THE WAY out the back, over the center row of seats, if she could just get him out a side window. Whatever happened was pretty bad, whether Tiger and Elin had a fight, or he just hit the tree as he was running to CVS for Baby Tylenol at 2:30 am, or he was having one of those Ambien sleep-walking episodes... hitting your neighbor's tree stinks no matter who you are. Many areas of Florida still have $100k condos (pre crash), so I guess it is all relative. Of course wages tend to be much lower there as well. But Tiger doesn't have to worry about that. I read that he was the first golfer to make 1B so, at 2.4M, what's he doing with all that extra cash? i thought the same thing but then realized that a) florida homes are much cheaper then here and b)house prices in florida dropped over 50% in the past 2 years. and he has several homes, this isn't his biggest. 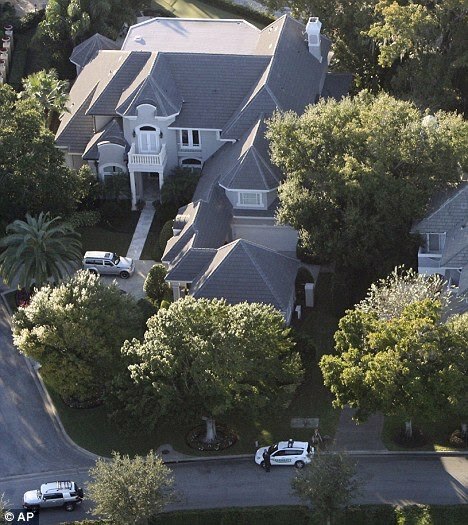 but i also couldn't believe the 911 caller didn't scream that its tiger woods - i heard a lot of sports stars live in that neighborhood so maybe its no big deal to the people that live there? I was thinking that too, that the caller may have been a high profile person as well. There was something awkward about the way he spoke in the first few seconds to the dispatcher, like he was hoping the guy wasn't going to ask the injured person's name! Yeah, I think Tiger has a house in the Hamptons, and I imagine he has one on the West Coast somewhere too! I happen to know someone who lives there are there are a great many athletes ,pro golfers and celebs that have homes there. I was wondering about whose voice that was too. Bet you anything the Enquirer tracks them down. You're absolutely right about the price. And also, what the hell, what's up with the close proximity of his neighbor's house? Wouldn't he want some privacy? That's Florida for you, all those houses are smack dab on top of each other. Stamfords prices are high we are catagorized as one of the richest counties in the US. Florida is cheap for such a big house.